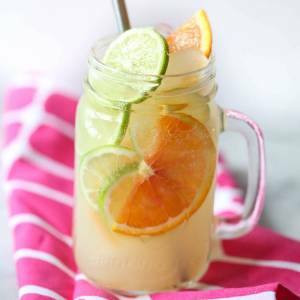 Valentine’s Day is coming up and if one of your traditions is serving your family a Valentine’s Day breakfast, this Sparkling Citrus Punch is an easy, festive drink. See, I used to always make everything from scratch and I kind of thought shortcuts were the cheater’s way out. And then I had kids and then my kids got older and I had more of them and they all kind of beat out of me any preconceived notions I had about a) what kind of parent I would be and b) never taking shortcuts. The way I see it, I have a finite amount of energy before I collapse onto my bed and stare at the wall for 40 minutes. With that in mind, I’d rather make homemade waffles or an egg casserole and take a shortcut on the drink which is either going to be gone in 15.3 seconds or is not going to be drunk at all. Same goes for entertaining…if the only thing I’m bringing to a party, I’ll make a fantastic salad. If I’m making everything for a party, it’s bagged salad, y’all. So. My solution for a fun, celebratory drink? Margarita mix. Make sure it’s non-alcoholic (unless that’s what you want…just don’t serve it to your kindergartner for breakfast…😂). You’ll find it with the cocktail mixers near the other drinks in your grocery store. You’ll know it’s non-alcoholic because it says “non-alcoholic” on the bottle and also because the version with alcohol (if it’s sold in your grocery store) will be more in the range of $17 instead of $4. 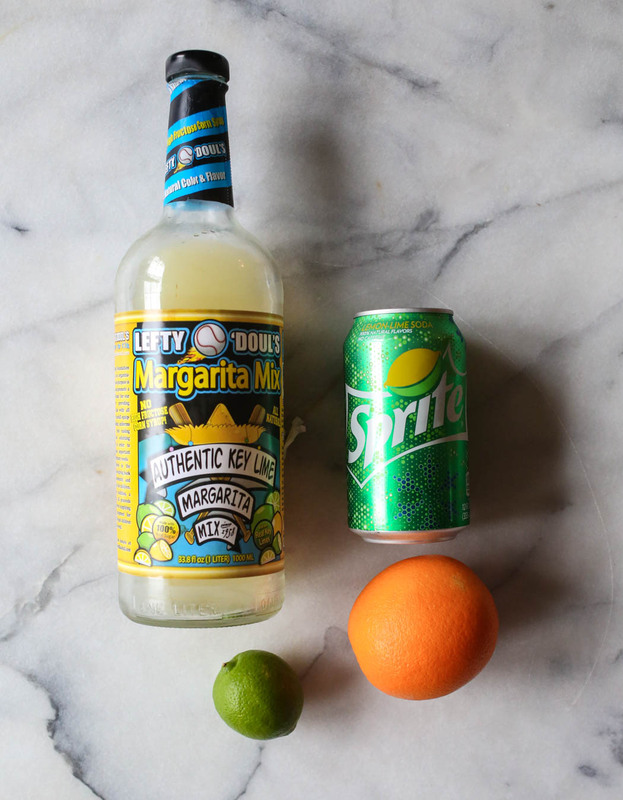 Most margarita mixes are just lime juice, sugar, and water and I knew I wanted something with orange, so you can either read the label and find one that has orange juice in it as well or you can add your own orange juice. At my grocery store, the only mix that had orange juice in it was Lefty O’Doul’s. Not being a margarita connoisseur myself, I was nervous about a drink mix with a baseball on the label, but it ended up being super delicious. 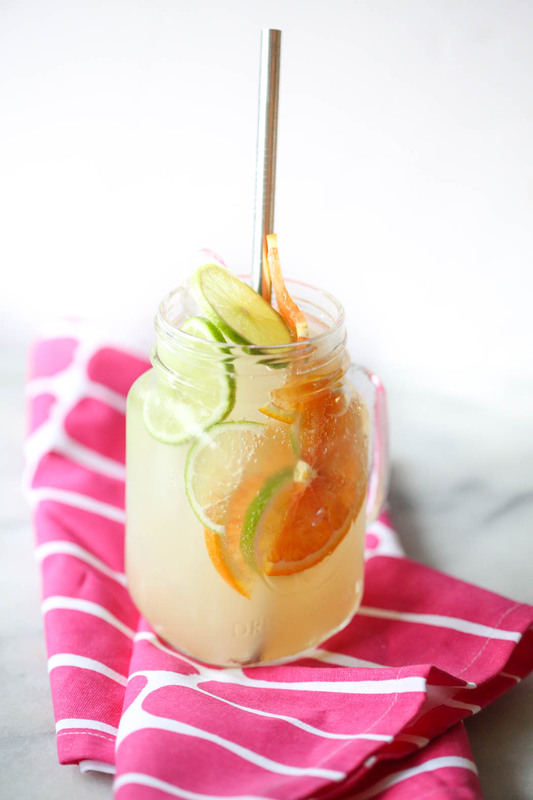 To make this punch, combine the chilled margarita mix and orange slices in a large pitcher. Right before serving, add lime slices (or a lime slice or two to each glass) and sparkling water or Sprite. Serve in fun glasses over lots and lots of ice. Still looking for Valentine’s Day ideas? Be sure and check out our entire Valentine’s Day section! 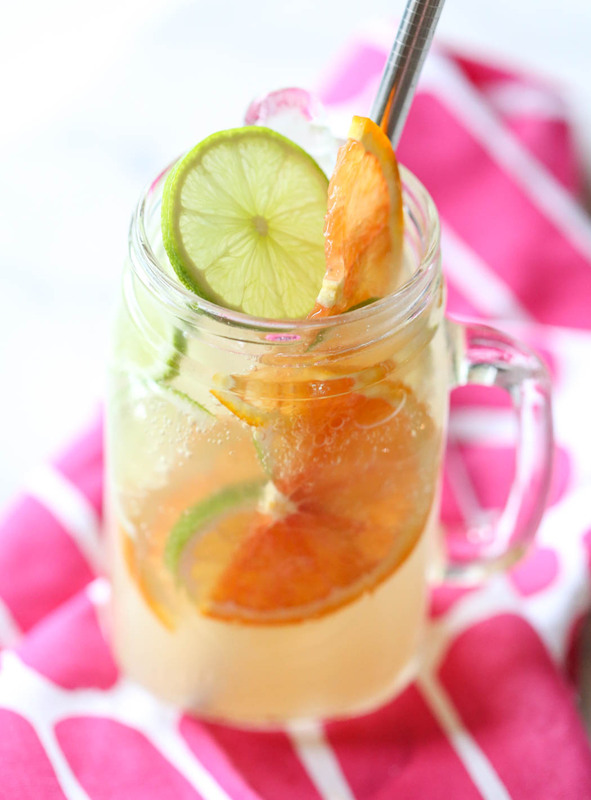 This quick and easy Sparkling Citrus Punch is perfect for breakfast or brunch! 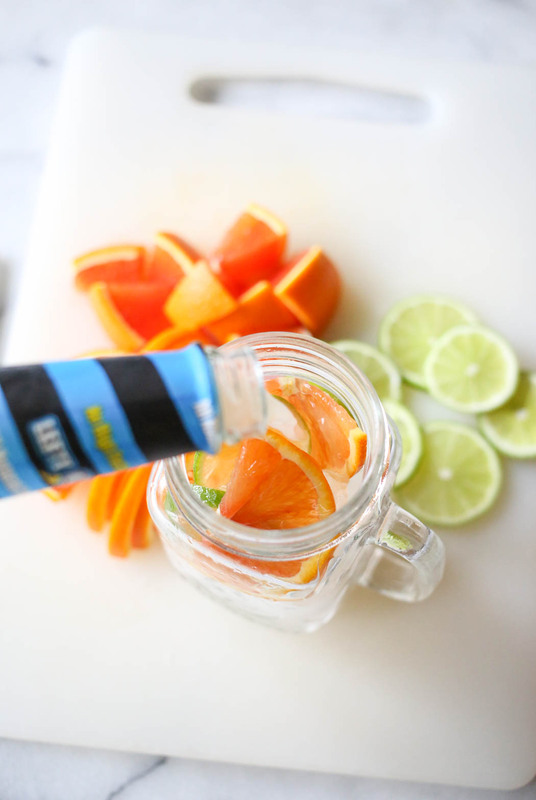 In a large pitcher, combine the margarita mix and orange slices. Right before serving, add sparkling water/sprite, lime slices, and raspberries. Serve over lots of ice. Yes!! And your 40 minute theory just blew my mind!! Because when I am making everything, I seriously go with the bag salad and the simple sides. Which annoys me because if I’m making the effort why not go all out… it’s because I’m tired!! Could you make this single servings? If so, how would you suggest? Absolutely! Fill a glass with ice, 3/4 cup margarita mix, too it off with sparkling water (about 1/4 cup), fruit to garnish. I just want to say, I don’t usually read commentary on recipe posts, I just scroll to the recipe. But with your posts, I just have to read it because I chuckle all the way through. This sounds delicious. I’m in love with a good virgin margarita, so this sounds right up my alley. Now I need to find a good justification to make 5 gallons of it and not share. I made this on Valentine’s Day for my girls and myself, and we loved it. It tastes quite a bit like the homemade limeade I sometimes make in the summer, but without all the lime squeezing and boiling sugar water. We had some left over that sat in the fridge overnight. In the morning it was even more tart and needed a little more ginger ale to balance things out. Thanks!